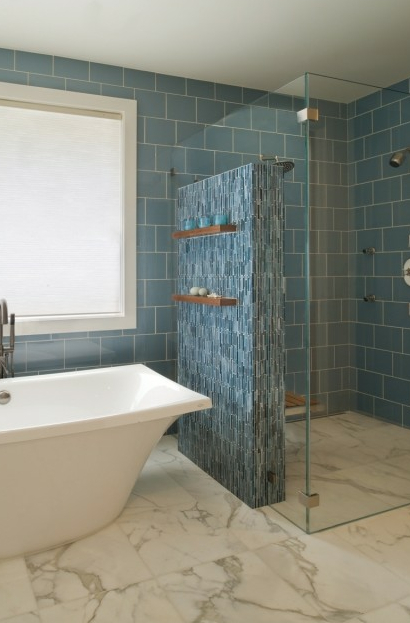 There are a lot of great bathroom remodeling trends out there. Here’s another one to consider during your home remodeling project: Heavy glass shower doors. These sleek doors are frameless; they’re mounted directly on the wall without a bulky frame closing them in. A lot of homeowners upgrade to a modern feel during their bath remodel, and these doors certainly accomplish that. Because they don’t have traditional frames, they can help the bathroom feel open and can even showcase the tile design you chose within the shower. 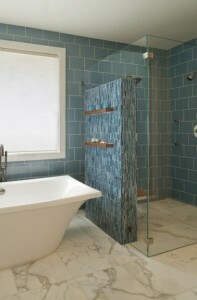 Heavy glass shower doors are also easy to clean, another consideration many homeowners make during their bath remodel. Because there isn’t a frame, there aren’t any tracks for soap residue to collect in or for mildew/mold to grow in. You also won’t need to worry about corrosion or rust thanks to the frameless design. Another benefit to heavy glass shower doors is that they’re cost effective. In addition to increasing the value of your home, they tend to last four times longer than traditional framed doors and almost never need maintenance because there are fewer pieces holding the door together (which means fewer pieces to potentially break). Before you invest in these doors during your bath remodel, it’s important to know that if your showerhead is too close to the door it might leak (which can easily be avoided by placing it further from the door) and that they do tend to be more expensive due to requiring sturdier glass and more time and effort to install. We think they’re well worth the cost in the long run, though, which is why we recommend them to clients that want a sleek, open, modern design for their bathroom. Want additional ideas for your bathroom remodel? Contact us for a complimentary in-home consultation!